This information was presented by John Hagel in a Scrum Alliance webinar, April 12, 2016. These are my notes plus a few thoughts. . The idea of Disruption in business was popularized in ‘97 in a book by Clayton Christensen. What is disruption? It occurs when most of the leading incumbents (in business, politics, technology, etc) are displaced by a new approach that is challenging to replicate. Disruption can usually be quickly seen in a change in economic factors or a change in mindsets. Most companies focus on their high-value estimates; their low-value customers don’t seem to be a threat. But as low-value items or services steadily improve, we see high-value customers shift to that. Firms must become Agile and be able to adjust on-the-fly to new technologies; they should not focus on adding improvement just to high-value things. John Hagel clarified that disruption is a universal phenomenon – “the story of the century.” Many companies are not weathering the storm. The average life of a leading company in the ‘50’s was 62 years – now it is 18 years. This is due to a fundamental shift in value creation, whereby consumers are gaining more power with more information and options, and knowledge workers are gaining more power in that talent has greater visibility, and higher wages can be continually demanded. Hagel’s research shows that there are patterns that can act as lenses through which disruption can be viewed. The first pattern relates to the transformation of value and economics. For example, the digital camera became a huge disruption to the photography industry, but now itself has been disrupted by the ability to embed digital cameras in cellphones. The second pattern relates to “harnessing network effects;” the more participants that join, the more value is created. This pattern is more enduring and challenging to disrupt. In your industry, what would you look for to understand market vulnerability? Would it be through product pricing, product modularity, demand characteristics, or supply constraints? If you assess your industry, which catalysts are the most important to understand to deal with disruption? My personal thought is that, given the organic nature of the world’s systems, whatever disruptions are trending in the world around us, sooner or later they will have an effect on most businesses and organizations. Disaster can be staved off by becoming more Agile in your organization. Agile will help everyone respond more quickly and with flexibility to disruptions. 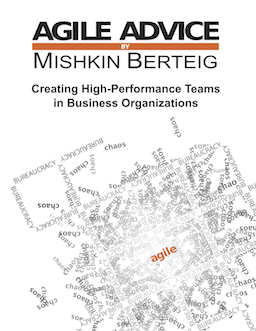 In fact, Agile itself has become a disruptive factor for outmoded ways of doing business. Previous PostProjectWorld Workshop: From Project to ProductNext PostWhat do we Mean by Transformation?